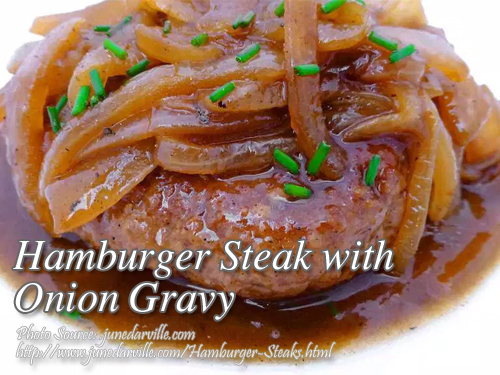 Want to cook a very simple hamburger steak? then I think this recipe is suited for you specially if you love onions. Beef and onions are the dynamic duo often found in beef dishes. So if you don’t like onions, you will miss the more flavorful taste of beef. And about the MSG, I think there is no concrete evidence that it is bad for our health. Maybe if eat too much of it it will be harmful. Take for example the common salt. Too much of it will also cause health problems. So that lesson there is eat moderately. To cook hamburger steak with onions; Mix the ground beef with 3 Tbsp. of finely chopped onions and season to taste with MSG, salt, and pepper. Shaped into thick patties and dredge into sifted flour and fry in a very hot lard until done. Remove fried burger patties from the pan. Reduce heat then add crushed garlic and 1 1/2 cups sliced onions. Add salt and pepper to taste and saute slowly until onions turns to brown. Sprinkle the flour and soy sauce over the sauteed onions. Add 1/2 cup water and simmer until the sauce is thick. Arrange the hamburgers on a platter and pour the sauce over the burgers. To see complete recipe, continue reading. Mix the ground beef with 3 Tbsp. of finely chopped onions and season to taste with MSG, salt, and pepper. Shaped into thick patties and dredge into sifted flour and fry in a very hot lard until done. Remove fried burger patties from the pan. Reduce heat then add crushed garlic and 1½ cups sliced onions. Add salt and pepper to taste and saute slowly until onions turns to brown. Sprinkle the flour and soy sauce over the sauteed onions. Add ½ cup water and simmer until the sauce is thick. Arrange the hamburgers on a platter and pour the sauce over the burgers.